There's very few television productions that capture the heart and mind and present to us,as a human race,better ways to think and live out our lives for a much higher purpose, than Doctor Who. Religeons and Fraternal groups have had their run and produced wars,murder and xenophobia,a world full of fear and anger. When all it would take,is to look at ourselves and change for the better,but being of a lazy disposition,sometimes it takes a gentle shove and a mirror,to reflect the ugliness that we are.And facing what we truly are is the hardest hurdle to overcome when change is recognized as needed and essential. This thread is to discuss the more abstract aspects of Doctor Who,the technology,the psychology and individual characters of this very entertaining and much loved Tv series. Doctor Who is catching up and I KNOW for a fact,they pay attention to the best in conspiracies and the Occult.Every bit of my music,pop art and sub-culture,all reflect,who I am,what I do,know and believe.I'm not the only one,just got hands on experience. This is a scene from Torchwood,S2-Ep11,Adrift,where poor Jonah,went into the rift and came back aged and damaged,after looking into the heart of a Dark Star.So did I.Back in 2000,I was hooked and chorded,by an occult group,paid,to get rid of me.In march 2000,I took the kids to the park to play,when the sky turned silver,and a voice and face appeared in the sun,it was a satanic type God,that told me things about myself,unknown to me.If I did'nt play its game,it would attack my children.I took it on and offered myself as a sacrifice,if it leaves my family alone.Weirder things happened after that. For years after,if I remembered what I seen,I'd seize up on the floor,near convulsing,begging to be left alone.Jonah saw a solar system and the civilizations refugeed and escaping.What I saw,was thousands of souls being broken up and dispersed...I nearly went insane,on the spot,now I know things you people will never believe until death,be kind to each other,be loving,cause you got to be strong,for what awaits...you all.Regards. symptoms is guilt,it's unavoidable for the Lonely Gods. releasing batlike sterilizing agents for time abberations. But this Doctor I love most,breaks my heart,the losses,the return of the dashing eccentric,madcap Tardis themes and more complex secrets are revealed,especially about the Type 40 Museum piece he flaunts time and space with. Now Brian joining the Entourage appeared to be a mistake at first to the Doctor,but remember,the Tardis is parts of events,she well knows beforehand the key players needed for the scenario to have a favourable outcome,she snatches Brian along with Rory,who are genetically connected,needed to pilot the controls of the Silurian ship,that they're about to board.It's not so ridiculous when she reveals she archives rooms not even invented for the Doctor yet.Maybe part of the unreliability of the Type 40 Tardis,its the true time meddler. eating a sandwich.A peaceful and beautiful moment. And for once,the Doctor is delighted,honoured by the request. Look beyond usual human desire and greed and maybe we all would see a little more. to the Time War,otherwise his motives remain concealed,only revealed to Rose in awkward moments.Loose lips sink ships,the Doctor,the Ninth Incarnation,is fresh/regenerated from the Battlezones,that exploded hundreds of stars,eleminating life,not just on a physical level,but dimensional level of existence.Many became extinct,some shifted to new realities,relocated in the vastness of space,some,burnt and survived through the fissures in fabric of time and space created by this Time War. to the Tardis,creating an inpenetrable forcefield. Eccleston Doctor.To last only one season by his choice,will be one of the greatest "If Only" moments in television patronage. When he regenerates,sometimes you have to look away,you don't want him to leave,but it's for love and sacrifice of another and that is important to series nature,it's primal message. When the ninth regenerates,one feels like you losing a close friend,replaced by a cheeky rapscallion of a stranger. The adjustment was a rocky event,unlike the 11th,who oddly enough,mirrored some of the authors more quirky experiences,so a kinship,besides he now wears purple suits and thinks he's Sagittarian,has formed in the mind of the author.The episodes with shared imagery is The 11th Hour,The Rings Of Akhaten,Hide and a few other shared quirks,like gathering intelligence from cats. The first will focus on the Apple from the 11th Hour. 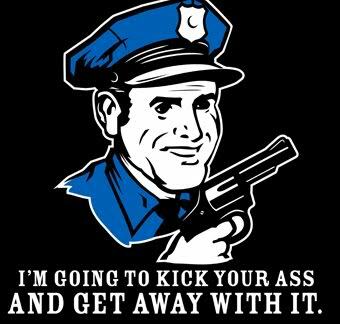 interrupted in his counter cleansing when marched upon,by over four hundred Satanist,running from them,through a cemetery,their little daggers waiving angrily. point,or Leyline...get back to this. Dr Who,The Impossible Planet,season 2-ep 8,David Tennant.After Toby,handles a skull,with an ancient unknown language,the symbols disappears,as Toby,unwittingly absorbs them and becomes possessed with a power,he does'nt understand. admit you're hurt at what you see and experience,fly in the face of adversary and all the ill deeds and be Godlike,you are the change that you want to be. Been waiting to see what episode the Doctor becomes duplicated,last night on the BBC in England,the episode,The Rebel Flesh,gave it away,with the Doctors death in regards to this seasons opening,The Impossible Astronaut. It's the duplicate Doctor from episode 5,that's assassinated in episode one,the assassin,well,it's the 1969 version of Canton Edward Delaware 3.How can the older version be there to oversee the cremation of the Dr's body?The Doctor gave him a lift with the tardis,as the duplicate,had an old Chevvy Wagon and a Stetson Hat.Which is great news,as Matt Smith,is the best of the Doctors,besides,Mr Eccleston,unlike the 9th,I hope to see Mr Smith last,4 years or more. Oh,if I'm wrong about Canton being the Assassin,because of paradoxes,time rifts...it's the Doctor himself,who is the assassin,but I doubt that,regards to you fans of the best Tv Show ever conceived...somehow,I don't think it's all to fictional,we are on the verge of experiments in time travel itself.In fact,this reality we are stuck in,could be a holding pattern to save the human race...but who?,will save us from ourselves??? That cute little sweetheart,Jenna Coleman,known to us as Clara Oswald had a birthday just recently.I love the celebrities that I do,but I don't immerse myself in their lives or know their particulars. 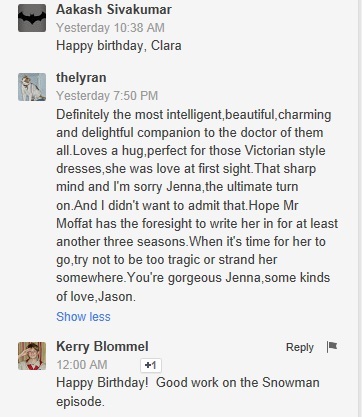 And I wouldn't know Jenna had a birthday,had I figured out how to modify the settings on my (Thelyran) Google+ page.It has a feature,what's hot....usually with religious messages.BUT I follow Doctor Whos material on Google and they sent this. but since I am one,I see some of those women as kin anyway,horoscopically speaking of course.I'm very against Scorpios,Piscean and starting to begrudge Cancers as well...funny enough,all from one house of the horoscope.Scorpios,over rated dramatist.Oh,they might be root rats,but a carcass is a carcass,I like the light of soul,not imparting a part of myself to feed their egos. Joe the crow,thought she was the ultimate for me,I destroyed those delusions...it was just an extension of masturbation,no feeling at all for her after the deed.It was just advice from Kristen,is why I did.She was a 27 year old nurse friend of mine,when I was a hot little hunky 19 year old.Damn good body and shape back then.Shovelled between 5-10 tonne in those days.I know why she did it...Naughty little Virgo she was. 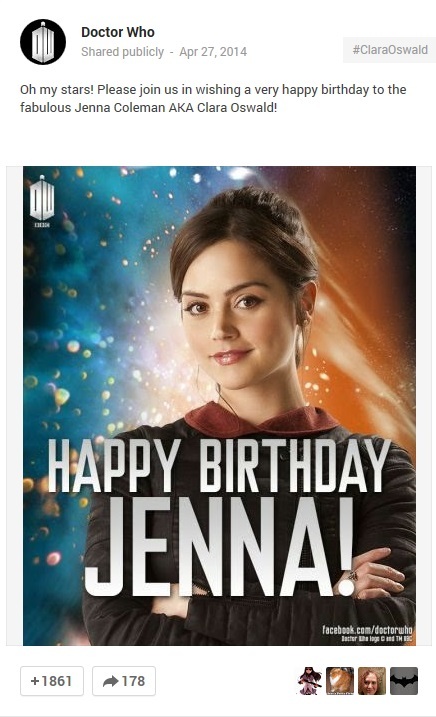 But seeing a pleasing picture of Jenna on my google page,that feline all knowing smirk she sports...I love that.Others with self image insecurities and issues would hate that,but not me. She deserves Goddess status and that's what I give her. Here's a few non-Doctor Who photos of this delightful little English lady. You're purrrrrfect to me Jenna,Happy Birthday Sweetheart.